The Tax Cuts and Jobs Act, signed into law at the end of 2017, expanded the use of Section 529 savings plans to be used for K–12 public, private, and religious school tuition. This could be a boon for some families. But regardless of where your children go to elementary or secondary school, 529 plans continue to offer a great opportunity for college savings. Section 529 plans are sponsored by states and colleges. Funds grow tax deferred, and withdrawals are free of federal income tax when used to pay qualified higher-education expenses, including tuition, fees, room and board, books, supplies, computer equipment, software, and Internet access. Under the new law, tax-free withdrawals for K-12 education are limited to $10,000 annually for each beneficiary and may be used only to pay for tuition. There is no specific dollar limit on qualified expenses for higher education. Although contributions to 529 plans are not deductible from federal income taxes, more than 30 states offer deductions or credits, typically to residents who contribute to a plan sponsored by their state.1 Other state benefits may include financial aid, scholarship funds, and protection from creditors. However, you are not limited to investing only in your state’s plan. A 529 savings account is set up for a single beneficiary, but assets may be transferred to another beneficiary in the same family. There are no income restrictions, so anyone who wants to provide financial support — parents, grandparents, or other family and friends — can contribute to a 529 plan opened on a student’s behalf. A 529 plan will not accept contributions after a beneficiary’s cumulative account balance reaches a fairly high limit that varies by state (typically $300,000 or more). You can contribute up to the $15,000 annual gift tax exclusion ($30,000 if married filing jointly) in 2018, per student, without triggering gift taxes. Alternatively, you can contribute five times the exclusion amount in a single year ($75,000, or $150,000 if married filing jointly), as long as you don’t contribute any additional money for the next four years. 529 plan assets owned by students and parents (but not those owned by grandparents or others) are considered in financial need calculations. However, withdrawals from 529 plans owned by anyone other than the student or parents count as student income for financial aid purposes and could have an impact on award money in later years. When 529 plan withdrawals are not used for qualified education expenses, earnings may be subject to ordinary federal and state income taxes and a 10% federal income tax penalty. As with other investments, there are fees and expenses associated with 529 plans. 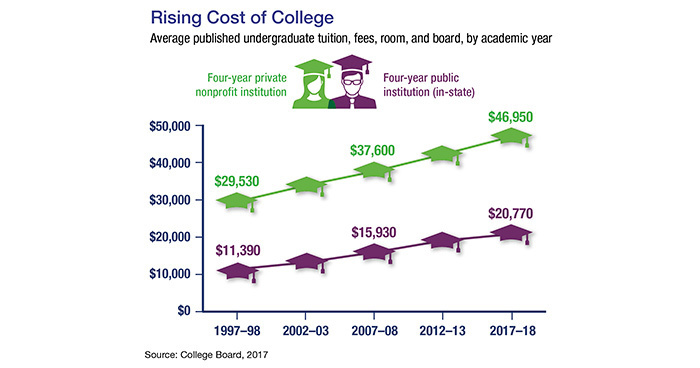 There is also the risk that the investments may lose money or not perform well enough to cover college costs as anticipated. Rules for 529 plans can vary by state, and some states may not adopt the federal provision for K-12 tuition. Be sure to consult a tax professional familiar with the laws of your state. Before investing in a 529 savings plan, please consider the investment objectives, risks, charges, and expenses carefully. The official disclosure statements and applicable prospectuses — which contain this and other information about the investment options, underlying investments, and investment company — can be obtained from your financial professional. You should read these materials carefully before investing. Securities and advisory services offered through Ameritas Investment Corp. (AIC). Member FINRA/SIPC. www.FINRA.org / www.SIPC.org. AIC and Peake Financial Group, LLC are not affiliated. This is not an offer of securities in any jurisdiction, nor is it specifically directed to a resident of any jurisdiction. As with any security, request a prospectus from your registered representative. Read it carefully before you invest or send money. Securities products are limited to residents of AL, CA, DC, FL, GA, MD, MI, NJ, NY, PA, TX and VA.
A representative from Peake Financial Group, LLC will contact you to provide requested information.